The SecureIt Agile Model 52 Gun Cabinet is a premium, heavy-duty firearm storage system. 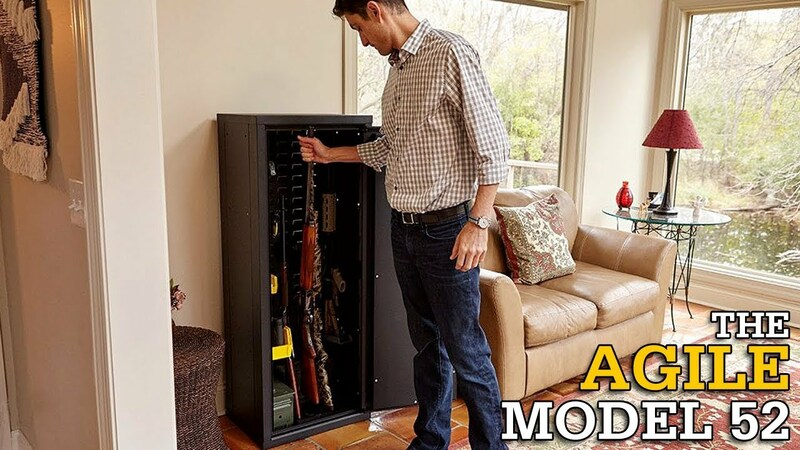 The Model 52 can do everything a traditional gun safe can do without being overly heavy and difficult to move. With SecureIt’s patent-pending KnockDown™ Technology, the Model 52 is delivered disassembled for easy transportation and can be assembled in minutes. All assembly is internal, therefore inaccessible when locked. The Agile Model 52 also comes standard with SecureIt’s CradleGrid Technology for organized and adaptable storage. I have had my eyes on the model 52 for some time. I knew I didn’t want to deal with a 400 lb safe that could be cut open with a grinder. After reading terrible reviews from gunsafes.com I decided to purchase directly from SecureIt. My cabinet shipped in a week. The packing job from SecureIt was incredible. There was not one scratch. I put this together by myself within 30 minutes. I couldn’t be happier, and feel privileged to own one of these incredible products. This is the best storage system on the market!! I have installed Cradle systems in a safe and Stackon cabinet. I love this stuff. The packaging was very good. When I opened that box I thought it was going to be hard to assemble. It was easy. Real easy. It is very rigid whet put together. The engineering on the construction style is very good. Makes my green Stackon cabinet feel like a cheap tin can. The lock is just like my safe lock. the overall cabinet is quite secure. I took some parts form my safe system to trick out the cabinet. – gotta get more bins! Thanks for such a great system and new cabinet! First I’d like to say i was impressed with the packaging. When I ordered I was afraid that my new Agile 52 would be damaged in shipping. There was no need to worry. The cabinet arrived perfectly. I unboxed it in my garage and carried it in piece by piece. Each part is easily movable by one person. It takes about an hour to assemble. I assembled it alone. It would be easier with two people but it can be done by one. I will be purchasing a cabinet when the production moves to the U.S.A. The owner said it’s a pain in the neck to manufacture in China logistically so I hope that is motivation to move production in the USA sooner. Thank you for taking the time to comment. I hear you loud and clear. We are working towards a US solution. It will take some time. We are relocating our primary warehouse to a more central location to reduce shipping costs and get quicker delivery. Once that is complete will will start looking at manufacturing. We want the manufacturing to be as close as possible to the warehouse. I purchased the Gen 2 model 52 around Thanksgiving for $449 – a price I was happy to pay for this cabinet. I’ve shopped around for quite awhile for something to store my long guns in and this fit the bill perfectly. I was awaiting the Gen 2 as it had the key lock in addition to the keypad which was important to me. I am under no illusion that this will offer the same protection you might see with more expensive safes, but I have mine tucked away in a closet in an office in my home that has a security system and cameras. I also mounted it to the wall in the closet so it isn’t going anywhere very easily. I also have my guns insured in case of a fire – no family heirlooms. The cabinet is perfect for my needs. I believe having quick access to firearms in various locations in the home is a good idea so this cabinet is also in line with that thinking. Further, I did not want to pay $2-3K for a safe that may or may not protect my guns from thieves or fire not to mention paying someone another $300-$400 to install it in my home. I think there are definitely some good safes out there, but you will have to pay a pretty penny to get one that does what you think it will do based on the research I’ve done. This cabinet was packaged perfectly and there was not a scratch on anything when I opened it. I was able to put it together myself in about 30 minutes using the videos online. This is likely the strongest gun cabinet out there once assembled – I am very impressed at how sturdy it appears to be. Mine however was missing an instruction manual as well as the bungie cords. Also, my cabinet was missing a row of louvers which was a bummer, but not the end of the world. I called Secure It and I have to say their customer service is truly outstanding. They resolved my issues quickly and were very friendly and apologetic in the process. Very impressed. A few issues I do have with this product are that while I truly love the cradle grid options, I’ve noted some flexing of the back panel with the louvers when I stack heavier items in the bins. I realize there is a loss of rigidity with all the louvers, but it definitely flexes more than I would like it to. Not a huge deal, but perhaps the metal could be reinforced somehow in future versions? I’d be happy with a little more weight if the back panel was more rigid. Also, probably my biggest issue with the cabinet now that I’ve had it for a month is the keypad itself. I just couldn’t seem to punch my code in very quickly – it finally dawned on me that the keypad is only 3 rows rather than the traditional 4 rows (ie 1-3 on the top, 4-6 next etc.). This keypad is 1-4 on the top, 5-8 on the next row and then *90# on the bottom row. In a stressful situation or in the dark, I’m sure this will slow me down in getting into the cabinet. I know practice will help, but I don’t love this now that I have used it for a bit. Not a deal breaker, but something worth mentioning. OVERALL, I love this product as it fits my needs perfectly. The ability to organize with the cradle grid options is outstanding. Definitely the best cabinet on the market IMO and I would definitely buy again. No gun cabinet or safe is perfect- I think the positives of this product far outweigh the negatives. Wanted a light-weight alternative to a heavy cumbersome gun safe. Best feature of this safe is its modular characteristics which allows you to customize the racks and shelving inside using the cradle grid system. Easy to put together and taking it apart for easy mobility. This cabinet can also be bolted down for added security. Well packed for shipping, no missing pieces. Feels very sturdy once assembled (much more sturdy than similar Stack On, but about the same as similar sized welded cabinets). Cradle grid is handy and works well for storage. Cabinet is sized well for my scoped rifles and fits my longest rifle with a inch or so to spare (Mosin). Price. I paid ~$500 for this cabinet. While this seems to be a well engineered, study cabinet. I’m just not sure it’s enough to put it above it’s competitors. I’ll grant you that the gun safe industry is a big set of lies and clever marketing, but I don’t think this is the right price point to dismantle the establishment. Since we’ve already established that anyone can get into a cabinet (including yours) with an angle grinder from Harbor freight, what then separates your cabinet from another other than how sturdy it feels? I don’t think at this price I’ll purchase another one. Foot plate for guns does not secure to the floor of the cabinet, it just sits there. The metal fold corners of the roof and floor plates(that slip over the walls during assembly) are not welded. This strikes me as an easily fixed weak point. Upon arrival, the folds were bent outwards in a couple places and I had to bend them back into place with a mallet. The fins cut into the back wall of the cabinet, for the cradle grid, flex more than you expect. “Ships Flat” is a bit of a misnomer. The box that mine shipped in was about the same dimensions as the assembled cabinet. With very limited living space to work with, the Model 52 does an amazing job of keeping my guns organized and out of reach from guests. I love the louvers and the options you get with potential accessory configurations. Watched the videos and very glad I jumped in. Took about an hour last night by myself to assemble the Model 52 Gun Cabinet. The instructions were a bit wordy but, if you’ve ever tried to assemble kids toys at Christmas, shouldn’t be a problem. Would like bigger pictures and fewer words. Otherwise very easy to see how everything fits together. Very solid when tightened up. The hardest part will be figuring out where I want to put everything, but that’s also one of the greatest benefits to this cabinet. It is very easy to configure the racks and bins, depending on what you need. I have 6 long guns and was able to put the shelves behind them. I haven’t yet figured out where I want all the bins, but that’s the fun part. I highly recommend this great solution. It’s perfect for securely storing guns out of sight in an easy configurable and semi-moveable system. No problem putting it in a closet. This cabinet is so much more useful than a huge, heavy safe. Certainly more practical. The SecureIt Gun Cabinet is not a fire-proof and burglar-proof vault (and neither are most gun “safes” available – watch the reviews). When you accept it for what it is and realistically assess your needs, you’ll find it is the perfect solution. Glad I ordered mine! Can’t wait to get my second one. Customer support provided same day email response and always got someone when I called. Highly recommend! This cabinet is a perfect fit for my needs. I love how light it is. I’ll never have to worry about moving it to a better location, as I can just empty it, and move it with ease. I watched the 11 minute assembly video on youtube prior to receiving the cabinet. Between the video and printed instructions, putting it together was a breeze. I had some questions about the keypad, battery and codes. Jeff, @ Secure IT was great and answered all of my questions. He was able to authoritatively speak to how the keypad, LED, and normal battery life ran. I’m very pleased with this product and the support I received after my purchase. I’ll definitely be a repeat customer. I’d be eager to see modular add-on cabinets that can bolted onto the top, or the bottom of this cabinet. Same width & length, but maybe 1.5′ or 2′ in height. Just got it -really like it – and ordered 2 more and a bunch of bins! GREAT CABINET! That craddle grid system is the best on the market and just works better. I really like the size. It fits in a small hidden spot in my closet. Assembly – while I think 1 person can assemble it, my wife helped and I think 2 people make it a very easy job. Very clean look and feel. The construction quality is very good everything lines up perfectly. Like the other review I read the cabinet is amazingly rigid and strong. – We just moved and I sold my gun safe instead of trying to move it. My wife said your never buying another gun safe…. she is right! Thanks for a great cabinet! I now have two Model 52’s (original version). They are very nice cabinets; well engineered and constructed. The only serious criticism I have with them was addressed with the new version (i.e., the ability to manually access the cabinet if the battery fails). Although I bought a metal storage tray for one of the cabinets, I found it a bit too narrow for many things beyond magazines and small ammunition boxes, and it is not readily attachable to the sides of the cabinets where it would be more accessible and useful for my purposes. However, I found a better storage solution with the stock base shelves. I bought one for one cabinet, and two for the other. Although they may have been intended to support stock bases for rifles, they make excellent storage shelves for pistol cases because they extend front to back almost the entire depth of the cabinet. Using them this way, however, pointed out one more issue that I wish SecureIt would address (viz. the louvers in the cabinet’s back panel do no extend all the way to the top of the cabinet). Consequently, it precludes, as a practical matter, using three shelves in a cabinet. Perhaps, SecureIt could produce a retrofit solution; a small panel with louvers to be attached to the upper inside back of the cabinet. To make it a bit more difficult for thieves to extract the cabinets from the closet where I’ve located them, and carry them away, I bolted the Cabinets together using the many pairs of holes that run up and down the sides. That also added greatly to the stability of the cabinets; they now are much more resistant to tipping over. Customer service is non pariel. Missing bungees in one shipment were quickly replaced; no questions asked. It’s really nice to be treated with such respect. My only regret is that I don’t have more closet space to devote to another cabinet. It’s 16 gauge for the sides and 14 for the door. I can’t get door to shut, the side post will not retract far enough. We apologize for the issue. Please email support@secureittactical.com for help with this issue. Thank you! Unfortunately, we are not running that promo at this time. We do offer 10% off on our website and offer other discounts for NRA members/Instructors, and people affiliated with the Military, Law Enforcement, and first responders. Thank you! Is humidity an issue with the Agile model? No humidity isn’t a problem with the Agile the louvered panels on the back allow for proper air flow(thus allowing for humidity to escape). However, if you have a humidity issue in your home you may want to use a dehumidifier. I’m very happy with the Model 52 I purchased and the customer service at SecureIt. The safe was easy to assemble and it completely meets my needs. I will definitely look to SecureIt for any products I need in the future. Can the door be mounted to open right to left (opposite as shown)? At this time the Doors of the Agile cabinets only open to 1 side. We are evaluating a left open door and it may be a future product. Also, consider the Answer 12 cabinet. It has double doors that don’t take up a lot of space. Thank you! First off, I think the design of the Agile 52 is one of the best solutions on the market. As soon as I can afford an Answer 12, I will be ordering one. However, the unit I received had several QC/Production flaws. The first issue is on the top right corner of the door. a thumbnail-sized piece of the coating had flacked of and was showing signs of rust. I don’t really care about the “beauty” of a gun cabinet, but this isn’t good to see on a quality product. The second issue was that both of the side panels were bent at the bottom corners. This made assembly an issue because the panel lock bar only locks correctly when the tabs are aligned. Bending them back straight they did function, but a quality control issue is apparent in my unit. After hauling the Agile 52 upstairs opening the packaging (which was undamaged and the previously mentioned issues were all on opposing side of the flat pack, so don’t blame the shipper) it was too much of a hassle to box the thing back up and deal with shipping it back for a replacement unit. I am not implying that Secureit is relying on great product design and RMA inconvenience to get away with bad QC, but I will be hesitant to purchase again without significant improvements in QC or better control of manufacturing. The Agile 52 is a significant investment for many smaller level gun owners, and the overall experience did not match the expectations set forth by Secureit in their marketing and very well done and informative videos. Does the Agile 52 have a removable shelf. I currently have 3 pistols a .22 .357 and 380 what are options to store them. I plan on adding shotguns and rifles later. Planning ahead. Thank you. No, the Agile™ does not come with a removable shelf. For pistols, we recommend using the Large Bin w/ Divider or our Single Pistol Peg. Keep in mind that our Pegs WILL NOT fit a .22 caliber. What is the warranty on the Agile 52? We have a 90-day Buy-It-Back Guarantee and a limited lifetime warranty. The lock carries a 1 year warranty from the manufacturer and the responsibility of SecureIt under this warranty is limited to replacement or repairs of defective parts with all transportation charges paid by the original purchaser. Today I assembled the Agile 52 I purchased. The packaging of the unit was pretty good. There were a couple of very small bends at the top of one side panel. But are hidden by the top cap when assembled. In general the unit assembles really easy, it’s well thought out and engineered. I needed a place to secure firearms, and don’t have a lot of room, so this works well. Two things that in my opinion should be included. 1st, when anchoring the unit at the bottom panel to the floor, the material isn’t thick enough to make the unit feel really secure. In other words you can rock it as the panel flexes a little. I made a, 11.250″ x 16.000″ 16ga. stainless steel panel with four holes to match the bottom panels hole locations. This will make the floor anchors pull against the entire lower panel, and not just at four washers. 2nd thing is a light. All safes, cabinets, etc. are as dark as a cave. A simple $5 battery powered light with a magnetic base solves that. I’m happy with the purchase, I like the modular storage this unit provides. Is the door swing reversible? Can the door be assembled so it swings to the left? No, not easily at least. You could flip the door during the assembly process however, the keypad would be at the bottom of the door. You would also be required to do a few more steps to get the handle to rotate properly. If this is something you’re looking to do, we recommend giving us a call (800-651-335) and we’ll put you in touch with one of our product specialists who can walk you through this process. Awesome cabinet! Light weight and easy to move. Assembly was easy. Would be cool to have a little light in there, but that’s just me trying to be fancy. Overall, awesome product! Packaged very well. Easy to put together. I will definitely be buying another one in the near future. Product shipped earlier than reported…easy to install (even by one person). Fits the bill for people with limited space and stairs. I bought two Agile 52’s the delivery was fast and assembly was quick and easy. My rifles and handguns fit with no problem. Can you choose the door hinge side? I need it to open the opposite of the photos. Is the door reversable, by that I mean I need the hinge to be on the left when I’m facing it? Or would It all work upside down, cradlegrid, can the electronic lock be reoriented if the cabinet were upside down? You would need to flip the door during the assembly process however, the keypad would be at the bottom of the door. You would also be required to do a few more steps to get the handle to rotate properly. If this is something you’re looking to do, we recommend giving us a call (800-651-335) and we’ll put you in touch with one of our product specialists who can walk you through this process. I’ve only had the Agile 52 for about a week and so far I do like it. It arrived on time and it was fairly easy to put together, (more on that later). Changing the combination was easy. It really is a fantastic alternative to the typical 800lb gun safes. It’s light and it provides easy access to your weapons. Unlike other gun safes on the market, it holds the number of rifles it says it holds (6). The cradle system is great. I’ve been wanting this gun cabinet for a long time now, and now that I have it, I’m confident I made the right choice. It really is a fantastic gun cabinet. While it was easy to put together, the instructions label each piece with a letter, but the actual pieces in the box are not labeled. All in all, this is a great gun cabinet and would recommend to anyone. Nice looking, easy to assemble, clear directions, work great. I’m not fond of electronic locks, I haven’t seen any reviews of the lock system. To me, that is the only Con of the product. I want to put this inside of another storage cabinet and mount it to the wall inside. Is this wall mountable if you will? What type of screws do you recommend to anchor the agile 52 or model 40 into wood floors? We recommend Lag Screws/Bolts for anchoring. If you have any questions please email support@secureittactical.com. Thank you! Why didn’t my review get posted? I used the link you sent after my purchase and spent a lot of time on it. I even bought a second one. Just wondering if you pick and choose your reviews. If possible, can you please resubmit your review? We’ll look into why it didn’t initially come through on our end. Thanks! I purchased this as a bundle with the extra bin package. I couldn’t be happier. My 6 year old and I put it together in minimal time. Truth is it took longer to get it unpacked, they did a wonderful job by the way, than it took to build it. It was simple and straightforward to assemble. I was having an issue with the keypad, user error, and called customer service. Within minutes I was good to go. These folks sell a great product and are very helpful. The only suggestion I would give in future models is possibly an illuminated keypad but it is great how it is! I will definitely be back as a future customer! Thank you so much for this wonderful review! We appreciate your feedback and will forward on your suggestions. Thank you! Just completed assembling the Agile Model 52 Gun cabinet. Did it as a fun activity with my wife and daughter. Putting it together referring the video on the Internet was a breeze. We did have to go out to get the 9 volt battery. The packing of the cabinet was top class, very well thought out package design. Someone put some serious thought into packing the various parts of the cabinet. There was no shipping damage, whatsoever. All parts got together and ended up as a very sturdy cabinet. No play of any kind, the cabinet is well designed in terms of the various parts coming together the way they do. The system for organizing firearms is awesome and very easy to setup. Overall I am completely satisfied with the quality of this product and it meets my expectation’s based on the advertised features of this Cabinet. Scope for improvements are w.r.t the height of the cabinet. Two of my shotgun’s which have long barrels plus extended choke tubes barely fit(but they did fit). If it was 2-3 more inches taller and adding more rows of louvers for longer firearms, and came with a quality 9 volt battery it would have been perfect. That being said, it did meet my requirements a 100% and hence deserves the 5 starts given in this review. I thing it was perfect for my needs. Great service from the company employees. They were very helpful with any questions that I had. I only have 2 recommendations. 1. Add 5-10 lbs to the the back panel and the 2 side panel. It will still be a lot lighter than most units out there. Excellent safe. Delivered right to my door and easy to move by myself. Assembly was easy but an extra set of hands are beneficial. I will be ordering a 2nd one today. My only suggestion would be to offer different door swing options. Only a left hand swing is available. For that reason alone, I had to give it 4 stars. This is a good solid safe. The instructions were clear and it was easy to assemble. Wonderful cabinet, but pricey. Love the louvered back panel for customization. I’d say my inventory is pretty typical, two shotguns, two hunting rifles, and a carbine AR-15. With the exception of the AR, everything in there goes up past the top louvre. One of the shotguns barely fits in, and with the substantial lip on the bottom and top pieces, I have to carefully maneuver it into place. What that means is the cradle grid is pretty much pointless. Without being able to utilize the cradlegrid in any substantial way, $600 for a cabinet that holds 6 guns I think is a bit steep. If the cabinet was 18″ or even 12″ higher, it would be significantly better. I’d be able to store parts and accessories, magazines, etc, like in the promotional pictures and like I was expecting to be able to do. Additionally, it would make it a lot easier to actually see into the cabinet. Had I known this in advance, I may have purchased it anyway because the footprint size is the exact size of one end of a closet in my house, so I was able to anchor it to 3 walls and the floor. But if it was taller, it would be “definitely” instead of “maybe”. The assembly was straight forward but it was a complete mystery how the ‘shear pins’ were supposed to be installed, and as far as I could tell it didn’t need them. Great product for organizational aficionados. Exactly as advertised. Holds firearms neatly. Easy to assemble./disassemble/move. A couple of assembly prongs were bent, but easily bent back into shape. A couple of screws for the cradles were missing, but were sent promptly by Securit upon request. Will be looking to add accessory items after some use. Purchased from gun safes.com out of Idaho. I had received my cabinet and the door frame was dented in several places as well as missing one of the hinge screws. After contacting them it seemed like it would be resolved easily however it didn’t seem to. I had to return to Afghanistan shortly after and was given the options to either receive free accessories or a replacement door. Since I wasn’t going to be home for a while I had asked if it was possible to just get a discount on another storage cabinet which they said was fine. After reaching out to them again when I was ready they had given a price quote that was higher than it was even listed online, this was because he had forgot to enter the discount is what I was told. After getting that worked out I explained I wouldn’t be home for a while and would need to wait on having the cabinet delivered because no one was there to receive it so it would have to be a certain time frame. They told me they could try and arrange it for that time frame for being shipped which was fine. However at this point the communication stopped and I never received another response from them. Also the discount that they gave me for the damaged door was the same % as the military discount so they weren’t exactly doing me any favors. As for the cabinet its sturdy and easy to put together you can do it yourself pretty easily and move it around easily as well. I haven’t had much use with it, but it seems fine. The key pad feels very cheap and doesn’t seem like its held on very well, you can press it and pull on the outside of it and see a gap open up around it. I think you could rip it off by hand if not a screwdriver could easily pry it off I’m sure that you could get the door open after that with little effort. This gun “safe” is no different than any other – it can be cut though in 10 minutes and your guns will be toast if it is in a fire. Decentralized Gun Storage and Four places to store firearms The best protection against fire is insurance or a “real” safe. This summer we will be releasing our “True” Safe. This is a real safe made in the tradition of the original Silas Herring fire safe design. We will be releasing details this spring. What you say is so very true. If you want a true gun safe then spend the money and buy one for $3,500 or so. There is nothing special about my firearms. I have some pistols, shotguns and a few rifles. Maybe $5,000 worth of guns. If I have a fire, and the chances are pretty remote inasmuch as my home is only 25years old, I expect that even if I had a true fire safe they would be as you say “toast.” IfI my house catches fire the loss of my guns will be the least of my worries, and besides that what I have fire insurance for. I am concerned with slowing the burglar down. If they hit my house they probably won’t get the cabinet open and what they will do is come back later with the proper tools to open the cabinet. That’s what burglars do. They might also graduate to a home invasion robbery as they now know I have something of value. It is the home invasion that I am most concerned with, and these cabinets provide me with access to my weapons while at the same time keeping unwanted parties (kids) from having access. This cabinet is everything it’s advertised to be: reasonably priced, light, solid, easy to assemble. There are just two issues which, together, I have to dock a star for. First, I had to contact support twice for quality control issues. The first time was because three of ten nuts needed for assembly were missing from the package. The second was due to an electrical issue with the keypad: sometimes it would beep and flash when I touched the metal casing, probably due to an intermittent short (bad solder application?). In both cases support was very responsive and quickly shipped me replacement parts at no cost, but it was still a hassle. Second, I wish the cabinet were a few inches taller. My guns all fit, but the longest one covers the top row of louvers, blocking me from installing a shelf or peg rack and leaving about six inches of wasted space at the top of the cabinet. Even keeping the cabinet height the same but adding a couple more rows of louvers at the top would be an improvement. Aside from this, though, the CradleGrid system is awesome and makes excellent use of interior space. I recently purchased my FIRST Secureit Model 52 and I do qualify as first because I will be buying more. I did my homework, checked all the reviews and watched all the videos before I placed my order. This safe is exactly what Tom on the videos says it is. Nothing more and nothing less. If you depend on sheer weight as a theft deterrent look elsewhere. I managed this safe from the time the UPS guy unloaded it, down the steps to the basement and assembled it from stem to stern completely solo. It was a snap. I took my time and it was less than one half hour total. The safe is very strong. No worries there. The six long guns I chose to store in the 52 have never been more secure or accessible. The design is almost perfect. I also purchased a variety of internal organization pieces and I am amazed at how much I have been able to squeeze in. By utilizing one tray, two large bins, one medium bin and seven small bins (the small ones fit behind the long guns easily as does the tray) I have stored ten handguns, a handful of AR mags, and around fifty Glock mags. One issue that hampered me from storing even more was that the long guns I chose for this safe are mostly scoped, some quite large and that limits the number of bins that can fit behind. With open sights or even red dots I could have probably doubled the number of small bins behind the long guns. I added a couple of battery operated LED lights and an Evadry unit, although with the back vents the moisture absorption is not needed. I would only change three things. I wish the vent slots started higher on the back wall as I could then squeeze even more handguns/mags into this safe. I understand this unit is designed for simplicity and economy but I placed mine in a carpeted closet and had to place wood along the front edge so it would not tip forward. Adjustable leveling would have been welcome. The third item has to do with the electronic lock programming and even though it is completely secure I have an issue with the programming that I choose not to disclose here. To repeat, I will be buying more because I have stuffed this one completely and like most of you, I am far from adding to my collection. Fantastic product! The cabinet is well built and feels quite secure for its size and weight. This is an excellent option if one is wishing to store items on the second floor of a home or in a small, hidden away space that would be too small for a gun safe. The cabinet is straight forward to assemble and, once finished, it feels very strong. This is a great option for people who have too move around a lot or who have limited options for storage space. The cradle grid storage is awesome. It stores the contents of the cabinet in a very organized, easy to access manner; in addition, it minimizes the likelihood of bumping/scratching items in the cabinet when removing contents. One last thing I appreciated was that the cabinet ships flat in a nondescript box (the inside packaging and protection is top notch) so there is no need to worry about notifying the neighbors or passersby that a safe is being brought into the building. Great product, and everything I was hoping it would be. I live in a townhouse (where I am prohibited from installing a safe), and I move around every few years for work, so purchasing and installing a large conventional “safe” just wasn’t an option for me. After getting fed up with my knock off cheap Wal-Mart cabinet, I stumbled on SecureIt and the Model 52. It has been a great option for me. The cabinet is limited to six long guns (as advertised), but holds six long guns without any problems. The rifles are very secure with the bases and cradles, giving me much more confidence than I had with my previous cabinet. The bins and various accessories are a must-have, too. I purchased the accessory set with the three large bins, three medium bins, and two shelf kits, along with a pistol peg I ordered separately. The bins work great for handguns and accessories, and I’m very pleased that the two shelves I got fit behind the row of long guns. All in all, the accessories really help you max out your space, but do so in a safe and secure way. Assembly is as easy as their YouTube video makes it out to be, and it is nice knowing that it can be easily dissembled when I move again. The cabinet comes together very rigidly; it definitely fees like a welded safe and not like a Stack-On cabinet, etc. The electronic lock works great, and is a nice touch. You certainly can’t get an electronic lock at this price point when buying a conventional safe. Lastly, I’m satisfied that this will be a good long-term option for me. You can bolt multiple cabinets together, and when my long gun collections grows past six I’ll buy another Model 52. I’ve also heard from SecureIt’s customer service that they are working on a smaller, on top, companion to the Model 52. If that is true, that will be a great place to store additional handguns/ammunition etc., and will allow you to really customize your storage. Best part is that the Model 52 fits in a closet, so it can be discrete and still be mounted to the wall or the floor. All in all a great product. Check out the company’s YouTube videos if you get a chance. It is crazy how easy it is to cut into a conventional “safe” through the sides, and how the heavy, massive locking doors on those safes are really not doing anything at all to make your firearms secure. Hopefully SecureIt’s products catch on; I think they fill an important space in the sporting community. Just set my new Model 52 cabinet up fast and easy. Very pleased will recommend to friends. Ordered November 17th and received the door on the 28th and the rest of the cabinet on the 29th. Both delivered by UPS. I put it together myself in a small space in the master bedroom. I slid it to its resting spot against the wall. Very happy with this cabinet! I’m not affiliated with this company in any way. Nice product. Great cabinet! great service. I want to thank Steve at Secure It for his help. Stores my rifles better and safer then anything I have seen. Love the small and medium bins. Excellent product, well designed, easy assembly, and it protects your firearms much better than a traditional gun safe. I was not crazy about the electronic lock, but it does its job. In the future I would like to add two of the Model 40s units on top of the Model 52’s for additional firearm and ammo storage. I have been searching for a cost effective, quality solution for keeping my firearms secure and the Agile 52 was my selection after lots of research. I was very pleased with how easy this was to assemble as I am a disabled vet and was able to assemble this by myself in spite of a bad shoulder. I watched the videos by WranglerStar on the Agile Series and Sootch00 on SecureIT’s Wall Armory Kit as well as most of the details on modern safe construction and that the US Marines use this syste,m and based off of these inputs I went with SecureIT and am thankful I did. The quality of construction and the engineering that went into this design are fantastic and the attention to detail with packing and shipping were excellent! Its a quality metal box, the shipping was fast and the packing materials were very solid. Easy to assemble, it’s light but solid when bolted to wall and floor. Electronic lock seems to work just great. Funky big skeleton keys for manual lock override are kind of comical, but work fine too. I’m not a fan of buying China products, but if you told me it was US made there is nothing to suggest otherwise in terms of quality. What is the maximum height on a standard ar platform a optics could have and still be stored? Currently I have to remove my optics before I store them. Would love to be able to store with a magazine and optics. The max an optic can come out is 4″. If you have other questions please email support@secureittactical.com for more info. Thank you! The Model 52 arrived quickly and in perfect condition. It was easy to assemble and secure and fit my rifles and hand guns perfectly. All are easy to see and access making going to and from the range a breeze. I already see a Model 42 expansion in my future. I recently purchased the Agile 52. The delivery time was excellent and the assembly was easy. I’m impressed with the quality of the cabinet, and I am quite satisfied with the purchase. My only warning to potential purchasers is that if you are going to store shotguns and longer rifles, the accessory storage bins and shelves will have very limited use, as the longer barrels block the area for shelving. That being said, I’ll probably be buying another Agile 52. Having worked in both law enforcement and the military, I can appreciate the wisdom of decentralizing your firearm storage. This method of storage coupled with home surveillance technology more than meets my needs. This is the main reason I wasn’t looking for a safe. Being cursed with the perpetual need for finding the best value for the money, I spent countless hours researching and comparing many of the cabinets available at the big box stores (e.g. Home Depot, Walmart, etc) and the online stores. I decided to initially go with a low-cost Stack On cabinet and was very disappointed with the quality of the product and the condition it arrived in. The cabinet was as dented the cabinet in seven areas and the item didn’t have keys. Needless to say, I returned the cabinet and decided to take the risk and purchase the more expensive SecureIt product. The Agile Model 52, arrive undamaged. The method of packing was well-engineered and likely the main reason the cabinet arrived undamaged. The assembly instructions were clearly written and easy to follow. Considering the exceptional packaging, quality of fit of each piece, and the function the cabinet, I’m pleased with my purchase and I’ll likely purchase the Agile Model 40 to place on top of the Model 52. I consider my rating closer to 4.5 stars. The Agile Model 52 would be a solid 5 stars if it was priced a bit little lower or if some of the minor discrepancies listed by other reviewers were addressed. Simy put… it’s an “Ultralight safe.” To be honest, probably the best light safe on the market. After reading some of the reviews on here, I’m wondering what some people are expecting (fire proof, etc). I work with law enforcement and I purchased this for my home. I can attest that the quality is top notch. I did have an issue with the older Model 52 but after a phone call and email, they took care of the issue and provided excellent customer service. Just simply wanted to say thank you. My neighbors and coworkers have seen mine and are all putting an order in soon. Thanks for the outstanding customer service, standing behind your product and for making an awesome safe. You made a customer for life out of me. I wrestled with what to do about a safe. my goals are to secure guns from kids and thieves. Given my neighborhood and proximity to the FD, I chose a secure and accessible Agile Model 52 over a traditional safe with a crummy interior. It is well made and the videos were VERY useful for assembly. I feel confident this was the right choice. I almost spent $1K on a poor-entry-level safe just to be done with it all. As I read, I began to see that since my guns were not collector items and I had no bearer-bonds to protect I didn’t need a traditional safe. I need to access, deter, and protect. SecureIt excels at those objectives. Suggestions… Though the fault is mine, I wish the instructions said, “fix to the floor or wall last!” in big red letters! My way was very hard and I had to start over. I agree made in the USA would be preferable. I like the accessories and the louvered back panel is brilliant. The Shear Pins didn’t help me any. I intend to add a Model 40 soon. Thanks! Absolutely, love this cabinet. It works as advertised. Thanks Tom for such a great product. It’s very easy to assemble. I don’t remember if the directions said it or not but, insert the shear pins before you place the angle brackets and nuts on the cabinet, it helped me. Very nicely designed and very easy to assemble by one person. When in-boxing my new safe I found both side panels had a bend/warp in them that took a little massaging during assembly to get rid of without messing up the panels. More than a tad pricey especially with the demoralizing “made in China” stamp on the side of the box, I wish Secureit was more “up front” with the source of the product. Harvey, Our plan as we have stated from the beginning of the Agile line development: build market awareness of the product, grow sales then move Mfg to the US. Low production manufacturing in the US is extremely expensive. When the sales volume reaches the tipping point we will move production to the US. Sales are growing and we are looking at building a production line for this product. Simply stated, we are a small company and there was no way we could start this product in the US. We made the decision to go to China for the first few years of production. Manufacturing these in China is a real pain in the neck. The quality is excellent but the logistics of dealing with China is tough. We look forward to US production and are working towards that goal. Excellent product and exactly as advertised, light, secure, high-quality materials. Based on the design, provides easy access and protects the guns. Holds 6 rifles and addition handgun as advertised, compared to the competition. Love the modular approach to grow with either the Modle 40 or another model 52 in the near future. Packaging problems have been addressed and would seem almost impossible to receive a defective/dented unit. Almost didn’t want to get rid of the packaging! For the money these are hard to beat. They are easy to assemble and to move into place. I purchased two units(Model 52)s and they are easy to bolt together to make them more stable. My only negative is the electronic locks that I received on mine. I think they are difficult to program and if you screw up, a locksmith must be consulted. I did not contact customer service yet, but will in the future. what do you do if the key pad battery dies? Thanks for your question. There is a key override on both the Agile™ Model 40 and the Agile™ Model 52.